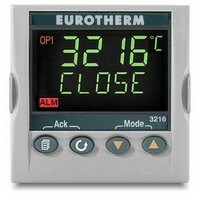 The Eurotherm 3216i indicator offers accurate indication and alarming of temperature and process measurements. Process interlocks, including over temperature furnace limits, are implemented using a relay output. The emphasis is on simplicity and ease of use. A simple 'QuickStart' code can be used to configure all the essential functions, including input sensor type, measurement range, control options and alarms - making 'Out of the Box' operation truly achievable. (rising or falling), that are auto or manual latching, non-latching or event only, and up to four conditions can be assigned to one output. The Contact Input can function as alarm acknowledge, keylock, alarm inhibit, freeze display.